Gold Preschool Honor Cord. Preschool graduation – this year has been so fun and now they’re almost done! Celebrate your little scholar’s developmental and social milestones with Gradshop.com’s Gold Honor Cord. Our premium honor cords are intertwined strands with a tassel on each end. Honor cords are worn around the neck with the ends of the cords hanging down the front side of the graduate's gown and two tassels on each side. 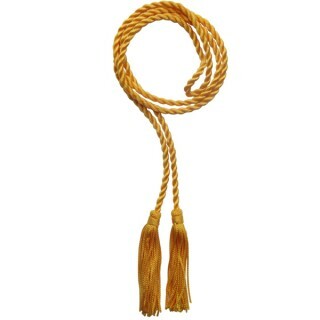 Our preschool honor cords are 39.4 inches in total length with a large 2.95 inch bulb tassel at each end. Now is the time to view your options on all graduation wear and apparel for low prices & great savings.